“April showers bring May flowers” (a very familiar phrase), but spring also brings lots of baby and wedding showers. Last spring when I was planning a baby shower for my daughter, I searched for different themes and decorating ideas. 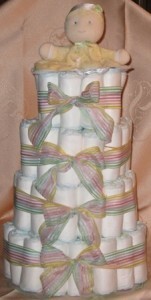 I came upon this wonderful idea for a centerpiece….a Diaper Cake. I was so impressed by it, that I decided to make one on my own. There are many selections of diaper cakes you can purchase (they range in price from $29.95 – $220, depending on the size of the cake, and additional decorations), but I liked the challenge of creating one of my own. After all, I had nothing to lose, even if the project failed, the diapers would still be usable. I would like to share my technique of creating a Diaper Cake Centerpiece. Roll up one diaper at a time, starting at the top and tightly rolling down to the bottom. Wrap around twice with a rubber band. Set aside until you have enough for one layer. The base layer will require at least 30 rolled up diapers. Layer two – at least 25 rolled up diapers. Layer three – at least 19 rolled up diapers. Top layer – at least 10 rolled up diapers. These numbers might vary slightly, depending on how tight you roll them, and how large is your middle stabilizer. Remove at least half of the paper towels from the roll, to slim it down, since you will use it for the middle stabilizer. Start arranging rolled diapers around the bottom of the stabilizer, at least two layers side by side, so your base layer is at least 12 inches in diameter. Secure layer with a large rubber band. Repeat same process for second layer and third. If your middle stabilizer is too short, you can extend it by inserting bottle washers in the middle, or some thin, long toy, or rattles, etc. Measure enough ribbon to go around each layer plus extra to tie a bow (you may chose not to have a bow, especially if the shower is for a baby boy). You can strategically tuck into the ribbon around the cake, some small toys or baby items, as additional decoration. Select your favorite topper for your cake. Voila….you are done, and your project is a success!!! Tips: You can decorate the layers with additional baby items like rattles, pacifiers, wash cloths, socks, bibs, small toys, etc. Stay tuned….additional baby shower posts are coming up! Actually this is a replica of the one I put together for my daughter’s baby shower. I could not find a suitable picture of the original one, and did not have any written instructions on how to make it, since I created it from just looking at a picture of one. Now I was writing down each step, as I was going along. It was fun, and much faster the second time around. Thats a lovely diaper cake and a very good set of instructions which I think even I could follow. Thanks for setting it out in detail – people like me need to be taken by the hand with things like this! I agree, diaper cakes are not that difficult at all to construct. For more diaper cake decorating ideas you may check my other posts on Baby Showers.